On dog days, you have to cook something quickly on the grill, in a skillet, or whatever you do when you want a quick blast of heat and then nothing. 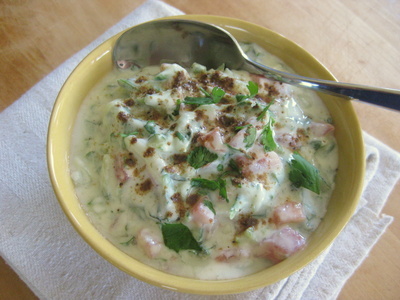 And then make raita, the cooling Indian dish of yogurt and finely chopped vegetables. This one, from the smart looking and enticing new "My Indian Kitchen," by former chef and food consultant Hari Nayak, is a particularly good version. Nayak grates his cukes, chops the tomato, and adds a chili pepper, fresh mint and coriander, and chaat masala (a spice blend). I had no chaat, so I used garam masala. Last night I had it with Nayak's curry in a hurry (watch for more of his recipes in upcoming blogs). 1. In a bowl, stir together the yogurt, cucumber, chili pepper, mint, coriander, chaat or garam masala, and salt. 2. Transfer to a bowl. Garnish with extra mint and coriander. Adapted from "My Indian Kitchen"
Boston's 'Summer of Riesling' heats up. Not too proud to keg.